Kandy (Sinhala: මහනුවර Mahanuwara, pronounced [mahanuʋərə]; Tamil: கண்டி Kandy, pronounced [ˈkaɳɖi]) is a major city in Sri Lanka located in the Central Province. It was the last capital of the ancient kings' era of Sri Lanka. The city lies in the midst of hills in the Kandy plateau, which crosses an area of tropical plantations, mainly tea. Kandy is both an administrative and religious city and is also the capital of the Central Province. Kandy is the home of The Temple of the Tooth Relic (Sri Dalada Maligawa), one of the most sacred places of worship in the Buddhist world. It was declared a world heritage site by UNESCO in 1988. The city and the region has been known by many different names and versions of those names. Some scholars suggest that the original name of Kandy was Katubulu Nuwara located near present Watapuluwa. However, the more popular historical name is Senkadagala or Senkadagalapura, officially Senkadagala Siriwardhana Maha Nuwara (meaning 'great city of Senkadagala of growing resplendence'), generally shortened to 'Maha Nuwara'. According to folklore, this name originated from one of the several possible sources. One being the city was named after a brahmin with the name Senkanda who lived in a cave near by, and another being a queen of Vikramabahu III was named Senkanda, and after a coloured stone named Senkadagala. The Kingdom of Kandy has also been known by various names. The English name Kandy, which originated during the colonial era, is derived from an anglicised version of the Sinhala Kanda Uda Rata (meaning the land on the mountain) or Kanda Uda Pas Rata (the five counties/countries on the mountain). The Portuguese shortened this to "Candea", using the name for both the kingdom and its capital. In Sinhala, Kandy is called Maha nuwara, meaning "Great City" or "Capital", although this is most often shortened to Nuwara. Historical records suggest that Kandy was first established by the Vikramabahu III (1357–1374 AD), who was the monarch of the Kingdom of Gampola, north of the present city, and named Senkadagalapura at the time. The Kandyan Convention signed between the British and the Kandyan Chiefs in 1815. In Köppen-Geiger climate classification system, its climate is tropical rainforest (Af). With Kandy located in the centre of the island and in a high elevation, the city has a relatively wetter and cooler temperatures than that of the tropical climate of the rest of the country, especially the coastal regions. Nuwara Eliya is south to it and has a cooler climate due to its higher elevation. Nevertheless, Kandy's climate is still tropical as mean temperatures year round are above 18° C on average. The city does experience a drier period from January to April. From May through to July and October to December the region experiences its monsoon season, during this time the weather is rough and unstable. From March through the middle of May is the intermonsoonal period, during this time there is light rain and strong humidity. The humidity is generally between 70% to 79%. Kandy is a Sinhalese majority city; there are sizable communities belonging to other ethnic groups, such as Moors and Tamils. The city remains an important religious centre of the Sinhalese and a place of pilgrimage for Buddhists, namely those belonging to the Theravada school. The Catholic Church has a diocese headquartered in the city. It is the second-largest city on the island and the capital of Central Province. Many major corporations have large branch offices in Kandy and many industries including textiles, Sri Lankan gemstones, furniture, information technology and jewellery are found there. Many agriculture research centers are located throughout the city. On the north shore of the lake, which is enclosed by a parapet of white stone dating to the beginning of the 19th century, are the city's official religious monuments, including the Royal Palace and the Temple of the Tooth, known as the Sri Dalada Maligawa (daḷadā māligāva). Reconstructed in the 18th century, the Sri Dalanda Maligawa is built on a base of granite that was inspired by the temples of Sri Lanka's former capital city, Anuradhapura. An array of materials (limestone, marble, sculpted wood, ivory, etc.) contribute to the richness of this temple. Throughout this small holy city, a number of recent Buddhist monasteries can be found. The Lankatilaka Temple is considered to be one of the best preserved examples of traditional Sinhalese temple architecture. Built on a rock, the temple is reached by a long series of rock cut steps. An arched passage of the image house leads through a Mandapa (hall) into the inner sanctum which is decorated with floral designs. The two side walls and the ceiling are decorated with paintings. In the inner sanctum is a large seated image of the Buddha. The Gadaladeniya Temple's design is of South Indian origin with a Devale attached to it, similar in character to the Natha Devale and the Gedige of Adahana Maluwa. The main shrine room has a seated Buddha statue and the remains of some paintings of the Gampola period. Among other important temples around Kandy are Dodanwala Devalaya (shrine), Embekka Devalaya (shrine), Galmaduwa Vihara temple, Handagala Vihara temple, Medawala Vihara and Nalanda Gedige. The Royal Botanical Garden, Peradeniya is situated about 5 km to the west of the city centre at Peradeniya and is visited by 2 million people per year. It is the largest botanical garden on the island extending to 147 acres (59 ha) and containing over 4000 species of plants.Knuckles Mountain Range in Kandy is a world heritage site of UNESCO. Alagalla Mountain Range also named in English as Potato Range both famous for trekking in Sri Lanka. The Udawatta Kele (Udawatta Forest) is a protected sanctuary situated in the heart of the city, just north of Temple of the Tooth. Known as "Uda Wasala Watta" in Sinhala meaning, "the garden situated above the royal palace" it was designated as a forest reserve in 1856, and it became a sanctuary in 1938. The Royal Palace Park, known as Wace Park is a small park that overlooks Kandy Lake and most of the city. In the park is a Japanese field gun which was captured by the British 14th Army in Burma during World War II and presented to the city of Kandy by Lord Mountbatten, Supreme Allied Commander South East Asia Theatre. 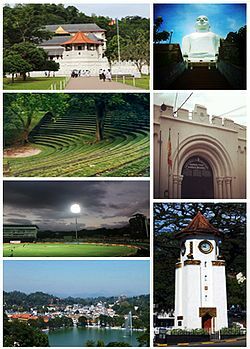 Kandy is home to some of the island's oldest and leading schools. The county's second oldest university, University of Peradeniya is situated in Peradeniya, while The Open University of Sri Lanka, The Sri Lanka Institute of Information Technology has a centre in the city. Most of the private-sector higher educational institutions also have their branches in Kandy. The Geology Department at the University of Peradeniya is the only earth science department in Sri Lanka. Kandyans do many things for leisure and entertainment in the city. Kandy is popular due to the annual procession known as the Esala Perahera, in which one of the inner caskets used for covering the tooth relic of Buddha is taken in a grand procession through the streets of the city. This casket is taken on a royal tusker. The procession includes traditional dancers and drummers, flag bearers of the provinces of the old Kandyan kingdom, the Nilames (lay custodians of temples ) wearing their traditional dresses, torch bearers and also the grandly attired elephant. This ceremony which is annually held in the months of July or August, attracts large crowds from all parts of the country and also many foreign tourists. Kandy City Centre is commercial and shopping complex open in 2005 at Dalada Veediya. Is the most modern commercial complex in Sri Lanka. The complex is studded with ultra modern features, also incorporating traditional architecture of Kandy during the medieval period of Sri Lanka. The city centre is host to several leading banks, a fully equipped supermarket, modern restaurants, an entertainment zone, a well designed state of the art food court, Sri Lanka's leading book shops, flora and an ayurweda site. There is a five-level car park outside that is the largest car park in Kandy. Much of the 1984 film Indiana Jones and the Temple of Doom was shot in Kandy. Kandy has established a proud record of producing some of the top most sports people in Sri Lanka for a wide range of sports such as cricket, rugby union, Association football, swimming, hockey, athletics, table tennis, boxing, swimming, basketball, golf and even baseball, which has only been introduced into Kandy recently. Kandy has produced national captains of cricket and rugby, and athletes that play at the highest level of all sports. Unlike the rest of the country rugby is the most popular sport in the region. This is because of the local rugby union club, Kandy Sports Club being the reigning Club Rugby Champions in the national league for almost a decade, as well as the fondness and support the local schools treat the sport with. The Singer Sri Lankan Airlines Rugby 7's tournament is an annual international rugby union event held at the local Bogambara Stadium, attracting nations from all over the world. Cricket is widely played in Kandy with the city having three first class teams in the Premier Trophy, Saracens, Kandy Cricket Club and Kandy Youth Cricket Club, as well as being the main city for the Sri Lankan Premier League side Kandurata Kites. Kandy is host to the Sri Lanka national cricket team with two Test status grounds, Asgiriya International Stadium and the newly built state of the art Pallekele International Cricket Stadium. Both stadiums have held World Cup matches. Other Cricket playing venues are Katugastota Oval (St.Anthony's College ground), Lake View ground at Dharmaraja College and Police ground Kandy. Sports like Hockey, volleyball, the national sport of Sri Lanka, and Association football however has not taken off in Kandy as much as other sports, due to the lack of proper playing fields, funding and support and Cue games like billiards and snooker have hardly anyone playing. However Basketball, Table tennis, badminton and even swimming are common due to the high participation of students and schools. ^ "Major Cultural Assets/Archaeological Sites". Department of Archaeology Sri Lanka. Archived from the original on 29 March 2010. Retrieved 24 October 2010. ^ "Sacred City of Kandy". UNESCO. Retrieved 1 May 2017. ^ a b c "Kandy Map". SriLankanMap. Retrieved 23 June 2011. ^ "Central highlands (Hill country) of Sri Lanka". Retrieved 24 October 2010. ^ "Badulla, Central Highlands of Sri Lanka". Retrieved 24 October 2010. ^ "Kandy – Nuwara Eliya Road". Retrieved 24 October 2010. ^ "Colombo – Kandy Road". Retrieved 24 October 2010. ^ a b "Climate: Kandy CP (altitude: 518 m) – Climate graph, Temperature graph, Climate table". Climate-Data.org. Retrieved 12 December 2013. ^ "Kandy Weather". eZeeStay. Archived from the original on 26 March 2012. Retrieved 22 June 2011. ^ "Kandy Weather and When to Go". TripAdvisor. Retrieved 22 June 2011. ^ "Kandy". tsitours. Retrieved 22 June 2011. ^ "Best Weather in Kandy, Sri Lanka". Weather2Travel. Retrieved 12 November 2013. ^ www.worldclimateguide.co.uk. "Kandy Climate Guide, Sri Lanka – World Climate Guide". ^ "World Climate: N07E080 – Weather history for travel real estate and education". ^ "City Profile". Kandy Municipal Council. Archived from the original on 13 December 2014. Retrieved 7 December 2014. ^ "City History". Kandy Municipal Council. Archived from the original on 13 December 2014. Retrieved 7 December 2014. ^ "The History of the Municipal Council". 19 June 2009. Archived from the original on 25 September 2010. Retrieved 24 October 2010. ^ "Teaching Hospital Peradeniya". peradeniya-hospital.health.gov.lk. ^ "Consultancy for KMTT design and construction supervision" (PDF). Archived from the original (PDF) on 2 February 2017. Retrieved 30 January 2017. ^ Maryam Azwer (5 August 2012). "Kandy Airport Most Likely In Kundasale – Chief Minister". The Sunday Leader. Archived from the original on 11 December 2011. Retrieved 5 August 2012. ^ "Temple Excursions Around Kandy, Sri Lanka". Retrieved 24 October 2010. ^ "Sri Dalada Maligawa". Retrieved 24 October 2010. ^ Marikar, Hafiz. "A Look At Sports In Kandy". The Sunday Leader. Retrieved 22 June 2011. ^ Wimalasurendre, Cyril (22 August 2013). "Kandy becomes Ayoddhya's sister city". The Island. Retrieved 5 May 2016. Seneviratna, Anuradha (2008). The Kandy Asala Perahara. Sri Lanka: Vijitha Yapa Publications. ISBN 978-955-665-017-4. Archived from the original on 10 August 2010. Retrieved 11 November 2010. Seneviratna, Anuradha (1999). World Heritage City of Kandy, Sri Lanka: Conservation and Development Plan. Sri Lanka: Central Cultural Fund. ISBN 978-955-613-126-0. Seneviratna, Anuradha (2008). Gateway to Kandy – Ancient monuments in the central hills of Sri Lanka. Sri Lanka: Vijitha Yapa Publications. ISBN 978-955-665-031-0. Archived from the original on 16 July 2011. Retrieved 11 November 2010. Seneviratna, Channa (2004). Kandy at War: Indigenous Military Resistance to European Expansion in Sri Lanka 1594–1818. Manohar. ISBN 978-81-7304-547-9. Wikimedia Commons has media related to Kandy. Wikivoyage has a travel guide for Kandy.